I know a lot about Dungeons & Dragons for someone who has never really played Dungeons & Dragons. My husband has been playing D&D since he was about 10; his group of friends has been playing together since high school, switching between various roleplaying settings from classic D&D to Pathfinder and finally now to Exalted. They frequently play at our house, so I know many of the details of their campaigns, and my husband loves telling me about the adventures their characters are having. Not to mention I’ve read a lot of Forgotten Realms books, including stories featuring Elminster and Drizzt. I finally got a chance to change that last month and really see what all the fuss is about with tabletop roleplaying games. One of my coworkers wanted to try her hand at running a game (or being Dungeon Master aka DM in D&D parlance), so she got a small group together at work and we successfully completed a one-shot campaign! We started with one session of character creation. Our DM brought some pre-made character sheets, so I started with one of those and then did some customization. My character is Temerity, a lawful neutral Tiefling Warlock. Tieflings are a race a wasn’t previously familiar with; they are creatures who made a deal with a devil (in my case, The Fiend) in return for great power. Temerity was previously a hermit, prefers logic to emotion, and is willing risk much in the quest for knowledge. We did a “point buy” system to pick our stats. My main stat was Charisma (I took Intimidation), and Strength was my dump stat. I like playing magic users (like my Jedi Consular healer in SWTOR), and I was looking forward to the challenge of roleplaying Temerity. The other characters in the party were a half-elf ranger, a drow rogue, and a bard. Our DM had picked a one-shot for level one characters called The Happenings at Barralon Manor (the setting info is all online if you are interested in running it, too). All our characters began as members of the Ducal Investigative Service (DIS). We were called to a small town by the mayor to investigate some mysterious disappearances at a manor house there. Our first combat, a face-off with some zombies, was a little slow as we all figured out which dice to roll, but pretty soon we got the hang of it and it became second nature. As a warlock, I was using d10s a lot to roll damage. When we finally reached the manor, we were attacked by a flock of birds. I didn’t think the combat was going well; if the whole party wasn’t going to die, then I certainly was. So after taking a few hits, instead of making a stand, I bolted for the manor door. Luckily it was unlocked! In retrospect, I probably should have warned the rest of the party that I was going to do this. But they got the message pretty quick, and we got through mostly unscathed (I did have to pull the bard’s body through the door after us; luckily I had the Medicine skill). The DM did a good job shepherding us through the story, as well as just going with the flow when we did the unexpected (like bolting for the door). At the beginning of the story, for example, we came across a family murdered by the zombies, and none of us had any interest in going after the children that had been left alive. We went back to the tavern instead. The final dungeon. The Erlking-looking orange guy is the boss. My character (white with the staff) is naturally at the back of the party, avoiding getting hit. At the end of the adventure, my character got to have some extra fun. Temerity had discovered a powerful temple to an evil deity during her hermitage; it seemed to me that the big bad was trying to locate it, so she took his notes and burned them. Although this was a one-shot, if we ever play the characters again that could have some big implications. And who knows? Maybe we will play these characters again. I don’t have a lot of time at all for gaming right now, but we all had a good time. I would definitely be interested in playing D&D in the future. It really was a lot like playing a video game RPG, so I think my experience with SWTOR helped me enjoy this experience, too. I have a complicated relationship with the term “gamer.” Specifically, referring to myself as one. It was my husband who really got me into gaming. He showed me the Star Wars RPG Knights of the Old Republic (KOTOR), he bought me a Wii, he let me play his account for the beta of my first MMO, SW:TOR, and we watched the Overwatch World Cup together. So, now I’m a gamer, I guess. Except…I don’t think I’ve ever played a game that he hasn’t played first, or with me. That still makes me feel lacking, like I’m just…borrowing his hobbies, or something. In my inane desire to change this, I somehow became fixated on Tomb Raider. The original game is a classic, and the 2013 reboot has the dual benefit of being both more feminist than the original and getting good reviews. Also, we already owned the game, and my husband never got around to playing it. I would be on my own. So, I set the difficulty to “easy” and gave it a shot. 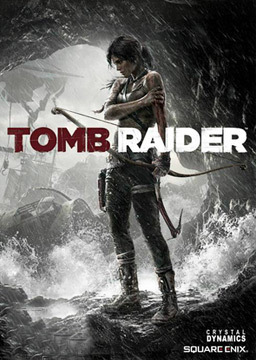 Tomb Raider follows a young Lara Croft on an expedition to find the lost kingdom of Yamatai, but her ship is wrecked and her crew is stranded on a mysterious island with a creepy cult and a strange reluctance to let anyone leave. 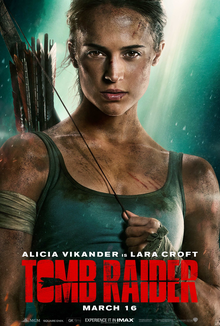 Lara must crawl through gross caves, explore dark tombs, and go down a lot of zip lines in order to find her crew and get them all off the island. Lara is exactly the kind of female main character I’ve been waiting for. She’s tough and scrappy, yet fiercely loyal to her crew, especially her best friend Sam. (Sam is a girl; there’s no romance here.) Lara’s got brains, brawn, and heart. Plus her costume redesign is spot on. The gameplay is fun, and has plenty of assists like auto aim and copious checkpoints to keep it from getting frustrating for n00bs like me. The puzzle-type challenges are my favorite, figuring out how to get from once place to another. Lara gets to use several different weapons and tools, so you can kind of figure out a combat style that best for you as well as best for the situation. Yeah, I’ve hit a couple spots I’ve had trouble with. I’m really bad at timing button presses. I also have a tendency to start combat by rushing in and just shooting at stuff without considering options. Usually I’ll hit a “tough combat” and die five times before I realize I was supposed to sneak around, or shoot an explosive to kill all enemies at once, or some other strategy that was obvious once I thought about it for two seconds. This gives me the strange feeling of both chagrin for having to die at least five times before I catch on, but also pride for catching on in the end. I’ve enjoyed the story so much that I’m really looking forward to the new Tomb Raider movie coming out this year, which seems like it inspired by this game. Action movies with females leads are still relatively rare, and it would be really great to see this iteration of Lara on the big screen. So, has playing Tomb Raider made me feel like a real gamer? Actually, kinda. As stupid as it sounds, I do feel more confident in my gaming abilities. Once or twice my husband has actually watched me play a video game for a change, instead of the other way around. I’m never going to play ranked PvP in a first person shooter or anything, but that’s not required and it’s not something I want to do anyways. I had discovered Mei, my Overwatch doppelgänger. Basically, I am Mei and Mei is me. Here are some details that illustrate my point. You may notice a similarity between “Mei” and my screen name “Mei-Mei,” but it’s actually even better than that. Mei’s full name is Mei-Ling, which you may recall is exactly the name of the anime character I took my pen name from (Li Meiling from Cardcaptor Sakura). I’ve already stipulated that I’m not Asian, but I am a girl, and I also wear nerdy glasses. Mei’s default “skin” is a blue parka, and my favorite color is blue. Speaking of the parka (which Mei wears because she was cryofrozen and now does ice attacks), I am always cold, and I would love to wear such a parka and boots all the time. Especially since we are getting plenty of lake effect snow this weekend. She has the cutest hair pin! I would totally wear that! Mei clearly has a dorky sense of humor because one of her emotes is “A-Mei-zing!” She also has a few ice puns (a la Mr. Freeze). I’m not really one for puns myself, but I do have a quirky sense of humor. Another classic emote is her “Sorry, sorry, I’m sorry, sorry.” This is totally me–I’m one of those people that apologize for everything, even when it’s not my fault. She has a cute little robot-pet-thing that assists with her abilities, and I could not live without my pets (currently two cats, one of which looooooves to “help”). Aaaand last but most important: Mei is a scientist, specifically concerned with the environment. I am also a scientist, and though I’m a biologist and not a climatologist, I have long been a supporter of environmental conservation. There’s one more thing that interests me about Mei that has to do with her style of gameplay. I’ve come to learn she’s actually one of the most hated characters in the game. Mei is a “defensive” character, who freezes opponents and puts up ice walls to block access to areas. Consequently, when you are playing against an effective Mei, your offensive characters can be shut down pretty well, and it can feel like you aren’t actually doing anything at all (one of the most frustrating feelings for a gamer). But it’s worse than that; Mei trolls her teammates as well. Because her ice walls affect everyone on the field, if you are playing with a bad Mei on your team (or are just unlucky), you can be cut off from your healer or tank, or prevented from making a killing shot, or unable to reach the target, or…see what I mean? Playing with a Mei can occasionally be as frustrating as playing against one. This feeling towards Mei perfectly encapsulates how I think people are feeling about me every time I play a game with Internet strangers. I am so self-conscious and have such low confidence in my gaming abilities that I feel like I’m going to ruin the game for everyone, and my teammates are going to jump on my mistakes and blame me for screwing them up. (Remember what I said about “sorry sorry sorry?”) It took me months to group with random people in SW: The Old Republic, the MMO I used to play. SO that’s the story of how I found myself in a video game. And after all that, my husband B has played as Mei for a grand total of about five minutes. He normally plays Lucio, the Brazilian rollerblading support, because no matter what game, somehow he always ends up playing the bard. Do you guys have video game doppelgängers? And who’s your favorite Overwatch character? What do you think of Mei? ETA: If you want to go slowly insane, check out this video featuring clips of Mei. If you play video games at all, especially RPGs, you’ve probably heard of Final Fantasy VII. It released in 1997 for the PlayStation and has come to be known as one of the greatest games of all time. It is certainly one of my husband’s favorite games ever, and he is greatly anticipating the upcoming high-definition remake of the game. He’s been wanting me to play the game for years; I’ve started it multiple times and never progressed very far (I didn’t even get to the open world map). So we’re taking a staycation this week and playing FFVII. Or more accurately, he’s watching me play it (the reverse of what usually happens). I’m playing on this actual PS1 and a tiny TV that B first used to play the game in the 90s. The game follows soldier-turned-rebel Cloud Strife and his party on their quest to save their planet from the evil Shinra corporation and the godlike Sephiroth. I already know the basic story, and “spoilers” for a 20-year-old game is kind of a silly concept. I’ve also already seen Advent Children, a movie set after the game. So I know all the characters, and I know who dies. My goal for Monday was simply to get farther in the game than I had before (aka, leave the Shinra building), and I was successful! B gave me a mod that started me with tons of XP and money, so combat is super easy and I don’t have to grind. This is speeding up the game a lot, and I might actually be able to finish it this week. I set this house on fire. Literally. As I said, B is watching me play so he can give me advice and help me when I get stuck. He knows exactly what to do to get specific outcomes. This is really helpful, because I’m used to relying on game journals in RPGs to remember what I’m supposed to be doing, but FFVII doesn’t have one, and I’d be wasting so much time just wandering around. B told me to get the one that shimmers so I get picked by the Don. But then B fell asleep, and I couldn’t figure out how to get the tiara or makeup. Aeris got picked. Oh well. My biggest challenge starting out was figuring out how to walk in a straight line, and where the paths go. In my defense, the graphics are not what I’m used to haha. But I’m getting better. I’m about 14 hours into the game now, and I’ve gotten out to Midgar onto the world map, crossed an ocean, and learned more about Cloud, Barret, and Red XIII’s backstories. Red XIII in particular is a favorite of mine; I call him “Red Shii” because of this video. I’m really enjoying way the story is told, with lots of unfolding mystery and flashbacks. I also already loved the music, which I’ve seen performed live, and I find myself humming along. My party is generally either Cloud/Tifa/Aeris or Cloud/RedXIII/Aeris. Basically, a fighter, a thief, and a magic user. The materia system is also really fun and I’m trying lots of combos with different characters. I can already see a little why this game had such a big impact on so many young gamers, including my husband, in the 90s. Maybe I’ll be playing the remake when it comes out, too! Honestly, I’m not sure I ever thought I would be at the level of geek where I sewed a bag to hold dice for a role-playing game. But here we are. My husband B has played Dungeons & Dragons since before I met him in middle school. He recently started a game of Exalted, another table-top RPG, with some friends; this game requires, like, three sets of d10 dice or something ridiculous. He wanted a separate bag for these dice, and drew up a picture of what he wanted. It looked pretty simple, so I told him we could make it. We bought some fabric but then never got around to doing anything with it. Just before last Christmas, B was gone for business for about a week, and I saw an opportunity. I have a terrible time surprising him with anything, because he notices the tiniest details and changes, but he is excellent at surprises for me. I figured I could make a dice bag in a couple of days (I also enlisted my mom’s help in planning). We made a quick pattern out of newspaper, basing the size of the bag off another dice bag B uses (that one is made of chain mail…). I cut out the colored triangles and sewed them together as shown in his design. Then I cut a black lining approximately the same size, sewed the two “inside” faces together. I added an extra seam at the top and threaded some black string though. I did this bag quickly, so it’s not perfect. My grandmother is turning over in her grave because my seams didn’t match up in some places. Aaand there’s cat hair on it already. Some quality sewing right there. But I did finish it in time, and B was definitely surprised. He’s been using it for his Exalted dice ever since. I didn’t add any decal to the front yet, but he’s said that instead of the dice in his sketch, he wants a yellow circle like a sun, which is the symbol of his Exalted character’s caste, Zenith. That’s the chain mail dice bag in the background.